I am grateful for the thousands of public educators who work very hard on behalf of their students. One can always hear horror stories in the news about disaffected and bored teachers, but the overwhelming majority of those I’ve met have cared deeply about their students and do their best in the classroom. I also see some signs of hope in what seems to be a general backlash against standardized testing brewing amidst some of our best educators. But even so, teachers in the current bureaucratic environment cannot help but be impacted by the mentality of standardization. I know of students who received A’s on assignments for having “great facts!” though these facts gave no overall understanding to the period studied. Another assignment I know of requires students to photograph themselves involved in a variety of environmentally beneficial activities, be it recycling, picking up litter, or not clubbing baby seals. Decades ago Jacques Maritain prophesied this in his thoughts on democratic education. 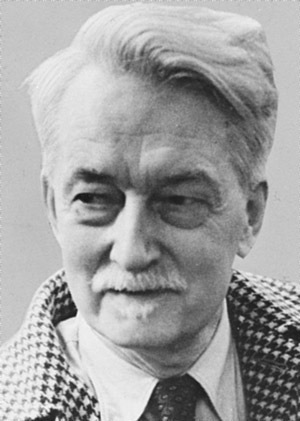 Maritain had a long and distinguished career as a theologian, philosopher, and social critic. Even in the 1950’s Maritain astutely observed the shift occurring in education as it related to the rest of society. If we are concerned with the future of civilization, we must be concerned primarily with a genuine understanding of what knowledge is: its values, its degrees, and how it can foster the inner unity of the human being. If we remember that the animal is a specialist . . . an educational program that aimed only at forming specialists . . . would lead indeed to a progressive animalization of the human mind and life. The state would summon education to make up for all that is lacking in the surrounding order in the matter of common inspiration, stable customs and traditions, common inherited standards, and unanimity. It would urge education to perform an immediate political task and, in order to compensate for all the deficiencies in civil society, to turn out in a hurry the type of person fitted to meet the immediate needs of the political power. This approach also takes freedom and inspiration away from teachers, who then assume the role of mere functionaries. Truth needs freedom to have its full effect. Teachers need to personalize their classroom experience in some way to give truth a living context, rather than rote formulas imposed from above and without. This is why, Maritain argues, the ambitious plan of “educating character” in this lock-step fashion will almost surely fail. The seeds teachers scatter will find only rocky ground. What I mean is that it is not enough to define a democratic society by its legal structure. Another element plays also a basic part — namely, the dynamic leaven or energy that fosters political movement, and which cannot be inscribed in any constitution or embodied in any institution, since it is both personal and contingent in nature, and rooted in free initiative. I should like to call the existential factor the prophetic factor. Democracy cannot do without it. The people need prophets. In our planning phase I wanted to stress to the students that. . .
Wars are not won by acts of violence. Don’t focus on hunting down the enemy. Make them react in the way you want them to. Or as Clauswitz might have put it, find their ‘center of gravity’ and seek to undermine it. Don’t begin the battle until it is already decided. In other words, focus on creating the conditions for success, then it will come to you easily. If we could make them bored, impatient, undisciplined, etc. we would have little problem earning the points we sought. Let the bad apples spoil the barrel. Many of our opponents would stay focused, and disciplined — but we could count on the fact that not all would. A large amount of our points came against a minority of students — students who had a habit of congregating together (creating an inviting target) or being quick to shoot first and ask questions later. This required patience and careful observation on the seniors part, but once armed with the appropriate information, we could take decisive action. After stating these general truths we broke up into squads and started planning Monday and Tuesday. Nearly all of the ideas came from the students. I stressed that plans and squads should be flexible. For us to have a legitimate chance to win, the students would have to cooperate with each on the fly, and expect to do so with different people as the game went on. I am proud to say that I saw a lot of this during the game. I’m also proud of how the 9-11 graders conducted themselves. All the students and teachers I have talked to commented that this year the game was more fun and fair than previous years, and that’s a testimony especially to the students. My many thanks goes to them. Please do ask your children about their experiences. I’m sure they had fun, and I think they learned something in the process not just about planning and coordination, but also about the particular challenges our country faces when fighting an insurgency. 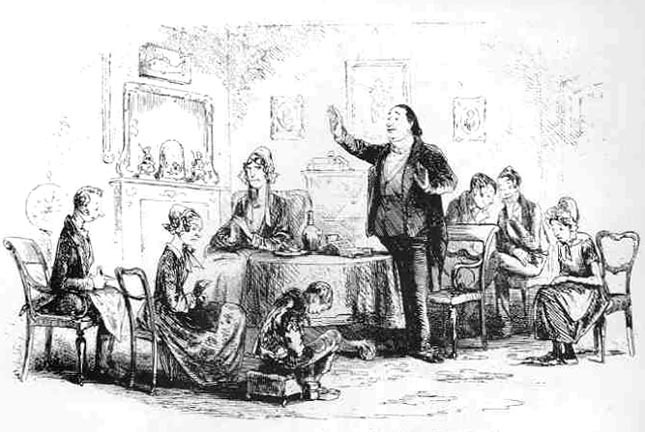 I confess that I have never been a big fan of Dickens. I get lost in the verbiage, and sometimes find his endings a bit dull and overdone. Still, I admit he deserves his fame as an all-time great, and he was perhaps the greatest creator of supporting characters of all time. Mr Snagsby, presuming on the success of his last point, ventures to observe in a cheerful and rather knowing tone, “No wings.” But, is immediately frowned down by Mrs Snagsby. 12th Grade: Do Power and Security have an Inverse Relationship? 1. As we discussed last week, terrorism arises as a kind of heresy against the prevailing orthodoxy of how states are constituted and distribute power. Their basic goals are the same, but as the rationale and goal of the state changes, so too do their methods and targets. So, for example, a ‘Nation-State’ terror group like IRA would be quite unlikely to want to use WMD’s against England/N. Ireland. The IRA was trying to create a national state for themselves, and it would not be in their interests to harm the territory they want for themselves to create their own national state. Unfortunately, modern terror groups like Al-Queda would seek them and use them, as they have global goals and are not interested in national territory per se. The targets too changed. The ‘State-Nation’ (1776-1914), for example, ordered itself along a ruling elite ‘fit’ to rule on behalf of the people. George Washington used this patrician attitude towards government generally for good, and Robespierre used a similar rationale to inflict the Reign of Terror on France. The State-Nation anarchists targeted the leaders of governments. This made sense for in the “State-Nation,” the leaders gave the identity to the nation. 2. U.S. strategy in the Cold War attempted for the most part to separate the domestic environment from our conflict abroad. That is, we believed that part of the key to winning the war would be to not substantially alter our normal lives. Throughout this unit we have been guided by the thoughts and categories of historian Philip Bobbitt, who controversially asserts that we may not be able to do this in the ‘War on Terror,’ in which our national territory can be easily infiltrated and made part of the battlefield. Is he right? Should we adjust our concept of privacy and the powers of government as part as a ‘weapon’ against terror? This is one his more controversial assertions that can certainly be debated. Another controversial assertion Bobbitt makes is that we should not see the powers of government and the rights of people as always operating in an inverse relationship. Rather, he believes they can, under the right circumstances, work together. Think of environments like the old west. People got there ahead of law, and the result was that many had to wear guns and could be intimidated through force. The fastest, most aggressive gun had the chance to hold a lot power. We would not call this freedom in the fullest sense. As law moved west, more freedom came with increased security and rule of law. His use of the western frontier does support his argument, but does this equation apply in every case? Would the increase of governmental powers always lead to more rights? If not, under what conditions would it do so? . . .it is the magistracies and powers created by illegitimate means which harm a republic, and not those appointed in the regular way, as was the case of Rome, where no Dictator ever failed to be beneficial to the Republic. In the same vein, Bobbitt urges us to consider that just as we stockpile food, vaccines, etc. for emergencies, so too we should stockpile laws. Try and mirror some of the basic strategic issues — the political and moral side of the war on terror. How much of their success will be dependent on the good will they build up among the other students? If they randomly detain, torture, etc. with no thought to broader consequences they may catch the bad guys but lose the people they seek to protect. This week we wrapped up Babylonian civilization by looking at the reign of Nebuchadnezzar through the Book of Daniel. 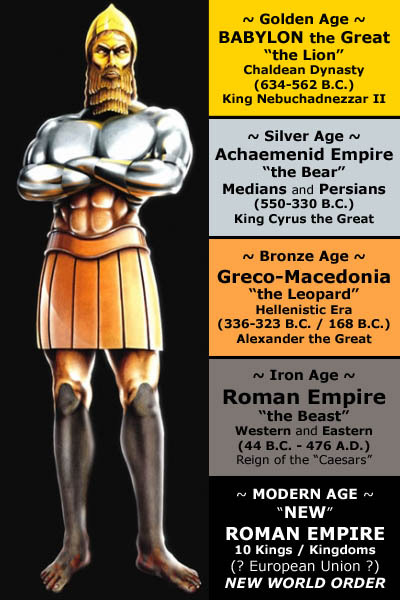 Nebuchadnezzar reigned as one of Babylon’s greatest kings and one of the more powerful kings in the ancient world. He had some significant faults, but also moments of keen insight. When we first meet him in Daniel 2, we see that he had no patience for the sham dream interpretations of the various astrologers and “wise men” of the realm. Then the astrologers answered the king, “May the king live forever! Tell your servants the dream, and we will interpret it.” The king replied to the astrologers, “This is what I have firmly decided: If you do not tell me what my dream was and interpret it, I will have you cut into pieces and your houses turned into piles of rubble. This may simply be Nebuchadnezzar’s famous temper showing itself, but he also knew that the astrologers would simply look in a book once he told them the dream, and parrot back what the book said. It doesn’t take a “wise man” to do that. Daniel’s eventual interpretation of the dream had many lessons for Babylon and us today. In its time, no other city on earth could equal the splendor and wealth of Babylon. Not surprisingly, the “head of gold” in the vision referred to Babylon itself. But even gold, the most precious and enduring of all metals, would eventually be superceded by the “silver” of Persia, the “bronze” of Greece, and the “iron” of Rome. Only God’s kingdom will truly last. The dream implicitly criticizes Babylon of course, and foretells of its coming judgment and dissolution, but Nebuchadnezzar has the wisdom and humility to reward Daniel and promote him within his kingdom. He seemed to like the whole “cut in pieces” concept. His second dream in Daniel 4 deals with him personally. He sees a great tree cut down and reduced to nothing, and Daniel tells him that the dream comes as a warning for Nebuchadnezzar to abandon all pride. Alas, he fails to heed the warnings and succumbed to madness. Nebuchadnezzar’s plight can serve as a template for examining other powerful leaders. His insanity came as a direct judgment from God, but it stemmed from his pride. When we think of clinically insane people we understand that they don’t live in reality, cannot perceive reality and cannot deal with reality. Might a link exist between pride and insanity? His claim reaches ridiculous proportions. Babylon had existed for centuries before Nebuchadnezzar, and no one would suggest that he did any of the actual building. It’s quite easy to give the orders, after all. Pride narrows the universe to one’s own dimensions and limitations. A prideful man’s heart becomes cramped and unbearable. Like other notorious rulers such as Stalin, Nero, and Caligula, Nebuchadnezzar didn’t begin insane, but ended this way. 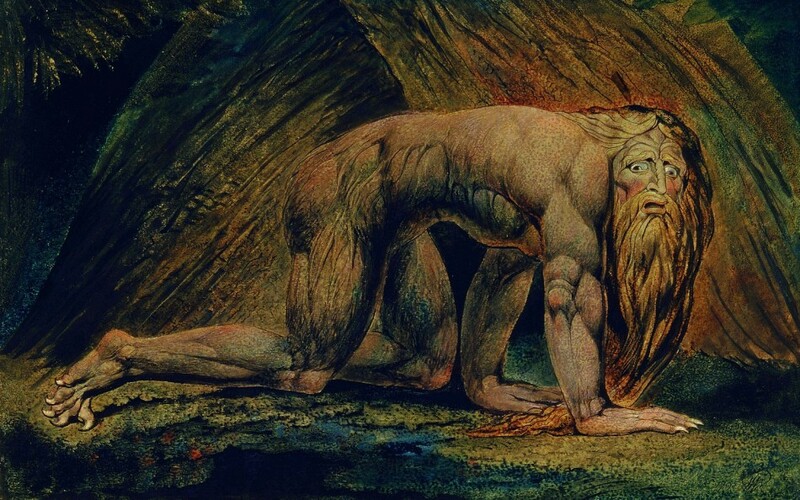 Pride leads Nebuchadnezzar down the path to madness. His sanity gets restored, however, when he “raised his eyes towards heaven,” possibly in silent prayer, or perhaps he simply recognized the universe outside of himself. At the same time that my sanity was restored, my honor and splendor were returned to me for the glory of my kingdom. My advisers and nobles sought me out, and I was restored to my throne and became even greater than before. Now I, Nebuchadnezzar, praise and exalt and glorify the King of heaven, because everything he does is right and all his ways are just. And those who walk in pride he is able to humble. While Nebuchadnezzar’s repentance saved himself, it could not save Babylon, which soon after would face conquest at the hands of Persia. This will be our next civilization.